Apparently the saying goes if you have rain on your day you are being blessed. It represents fertility, cleansing and unity and who doesn’t want these things as you’re about to embark on a new chapter in your life. 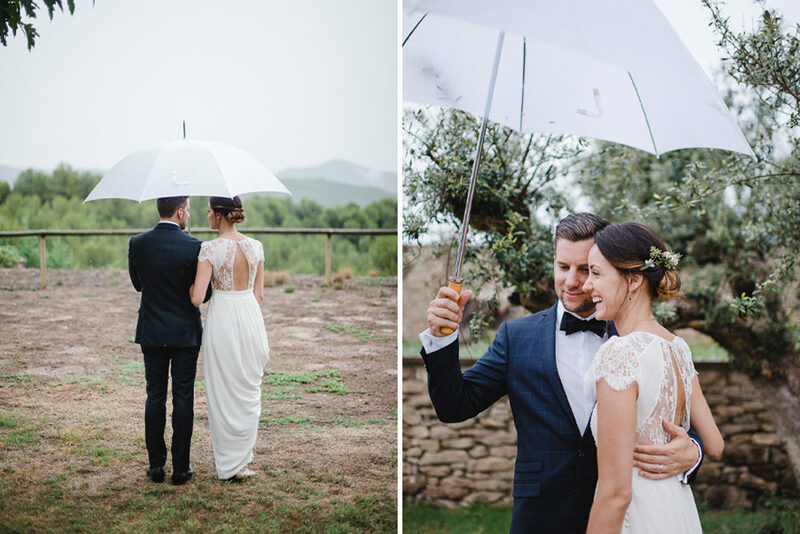 Yagmur & Alex must have been truly blessed with the amount of rainfall they encountered at their Spanish destination wedding, not that you’d know from all the smiles and happiness captured by Padilla & Rigau. The dreamy umbrella portraits could easily be mistaken for parasols. Yagmur the Bride: Alex and I met 9 years ago while studying in Barcelona. We lived there together for almost 2 years before relocating to France to pursue our Masters. For our 6-year anniversary Alex surprised me with a trip to Barcelona, where he proposed at the Cathedral of Tibidabo, a place that saw the beginning of our relationship. Alex is German/Luxembourgish and I am Swedish/Turkish, we currently live in Zurich, Switzerland and having studied abroad we have friends and family all over the world. We both knew immediately that we wanted to bring our loved ones to celebrate our union back in the place where it all started. 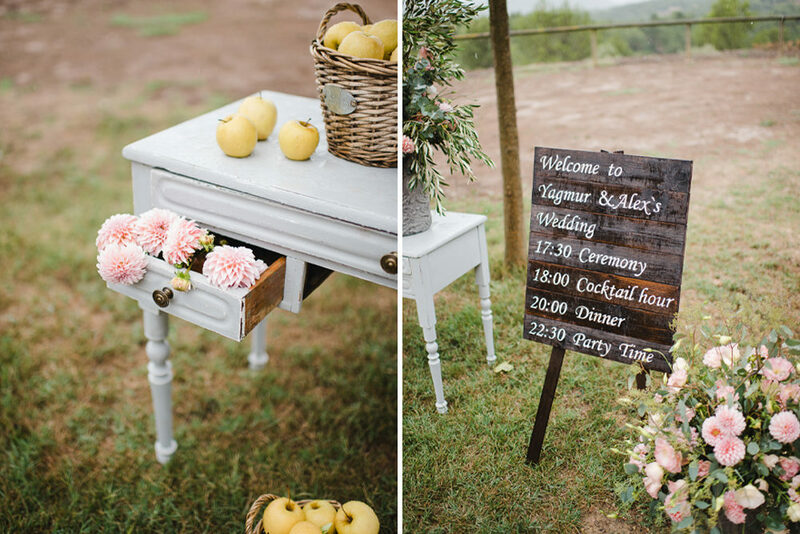 We envisioned an intimate, romantic and relaxed out-door wedding where, more than anything, our guests would have a great time! 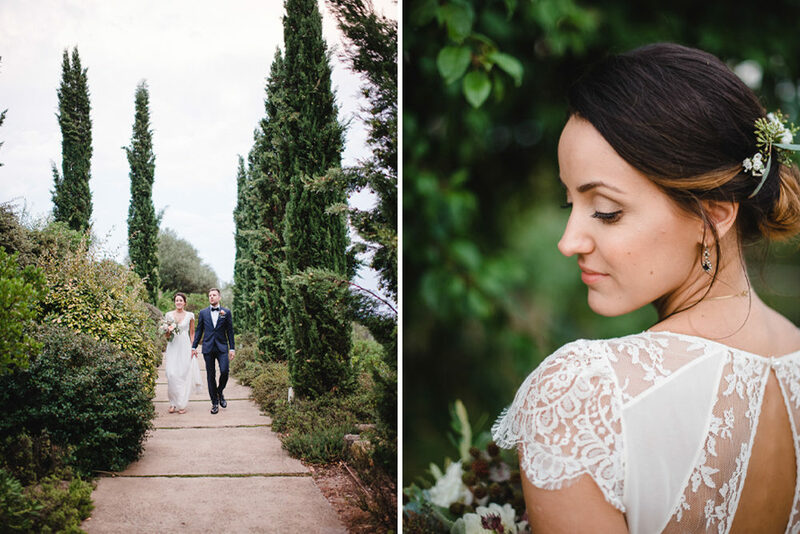 We wanted our wedding to be held at a Masia, a Catalan farmhouse, so off we went on a road trip through the Catalan countryside for location scouting. When we found La Garriga de Castelladral we immediately fell in love with it. We spent our wedding weekend there with our closest friends and family and every single day was an absolute dream. 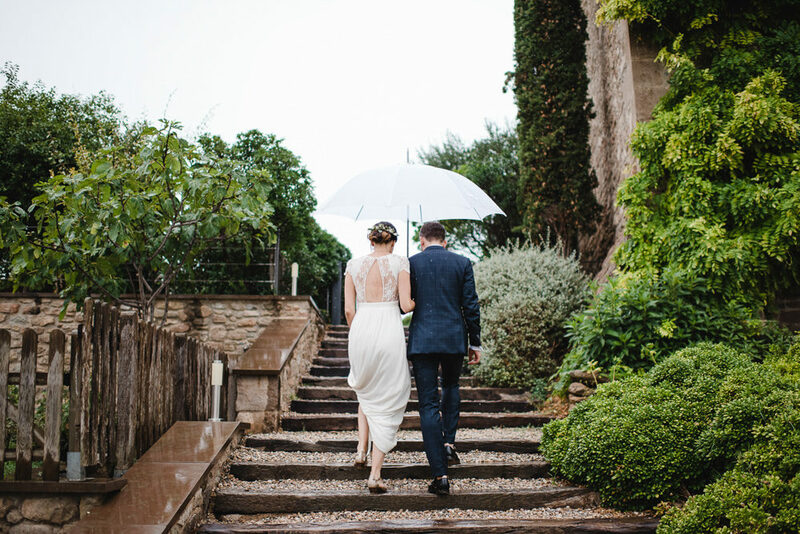 Planning an August wedding in Barcelona, it did not once cross my mind that our all-outdoor wedding would be hit with the craziest showers of the season. I was adamant about not moving the ceremony or the cocktail hour indoors and the family of the Masia did an incredible job coming up with options and helping us with tents and rain protection. 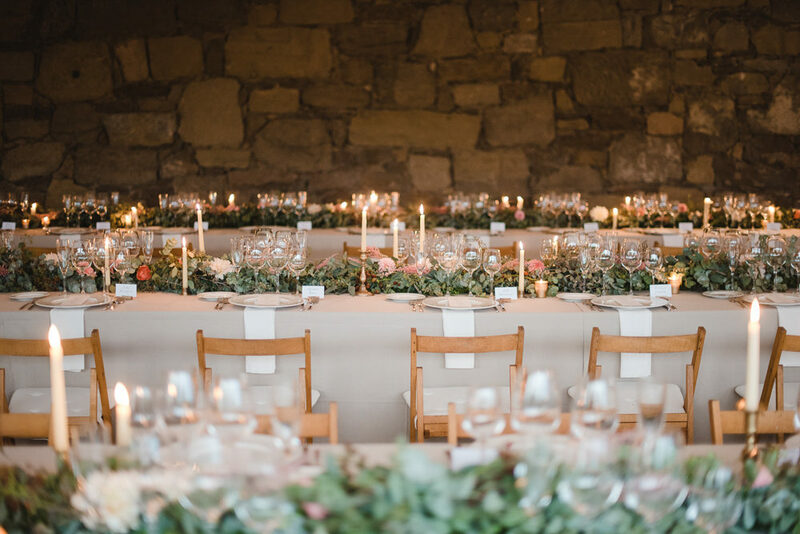 Our ceremony was supposed to be held at the forest of the Masia and flowers and decorations were planned natural and rustic. 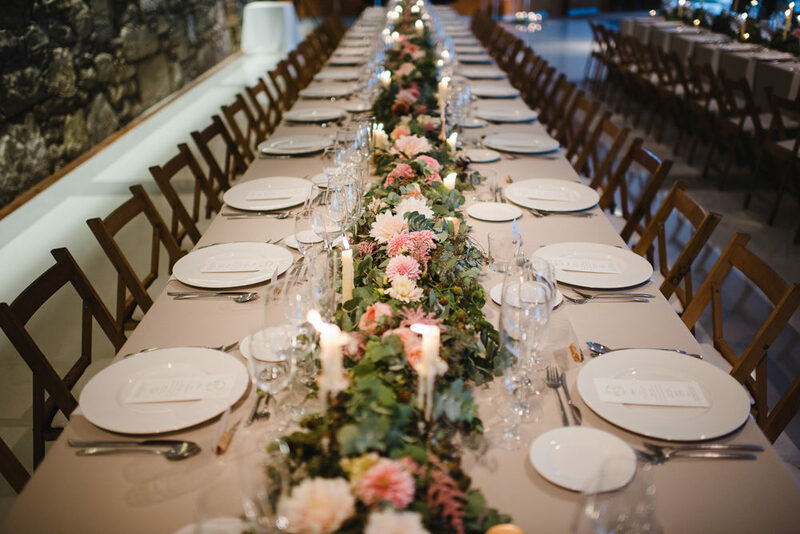 Our florist Natalia managed to turn our Plan B into a beautiful ceremony location, our guests did not even realize it was our Plan B until we told them! It rained and it poured almost all day and our friends and family countered the grey skies with their love and support and our photographers and videographers got soaking wet trying to capture our day while holding umbrellas over us. Looking at the photos, you almost can’t tell it was raining! 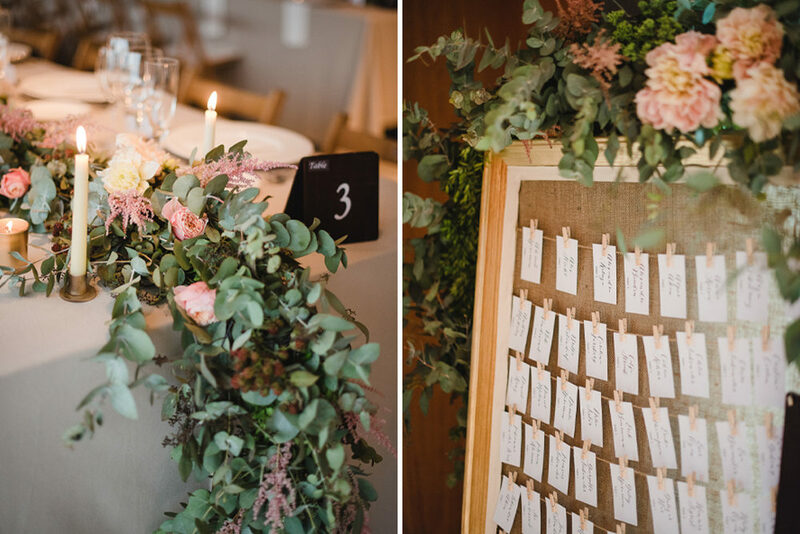 Our wedding was a true DIY affair from the start. Alex’s dad officiated our ceremony, his sister read a beautiful poem and my brother sang “Fly me to the moon” by Frank Sinatra, playing his acoustic guitar. Alex’s father not only officiated our wedding but he also designed and built all the signs we used throughout the day as well as our card box and a cigar bar on a barrel. Our wedding logo was designed by Alex’s sister and the menu, programs, name cards and all artwork used throughout the wedding were all a DIY project of mine. Working with advertising, I was happy to have picked up a few useful design skills that came in handy for our wedding. The corks used for our place cards were collected with the help of family and friends, and the week before our wedding we hand cut each and every one of them. We gifted our guests with Turkish peshtemals, which my mother brought from Turkey. They were wrapped with the traditional Turkish evil eye and lavender, which my mother handpicked and dried for our wedding. 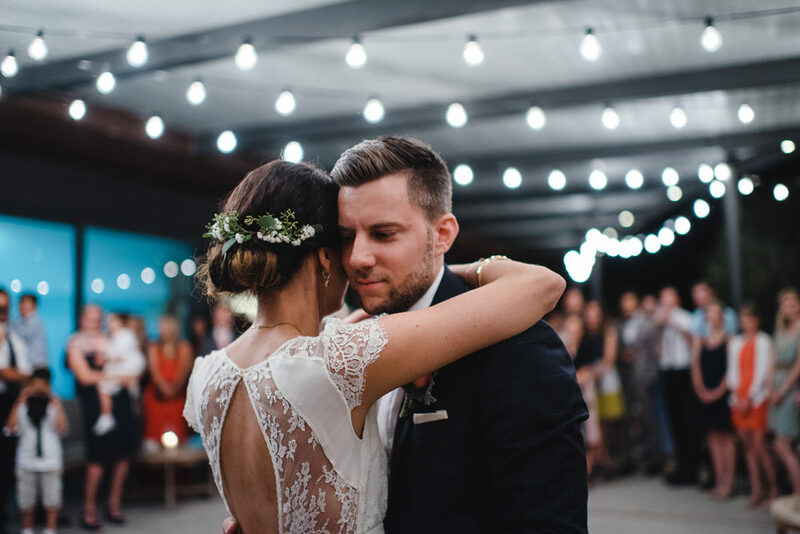 Needless to say, it was a true family DIY affair, which made our day feel even more special. At our ceremony, the rain we were initially down about ended up making everything more intimate and romantic. Exchanging our vows in front of all our loved ones to the sound of the pouring rain felt so cozy and special. 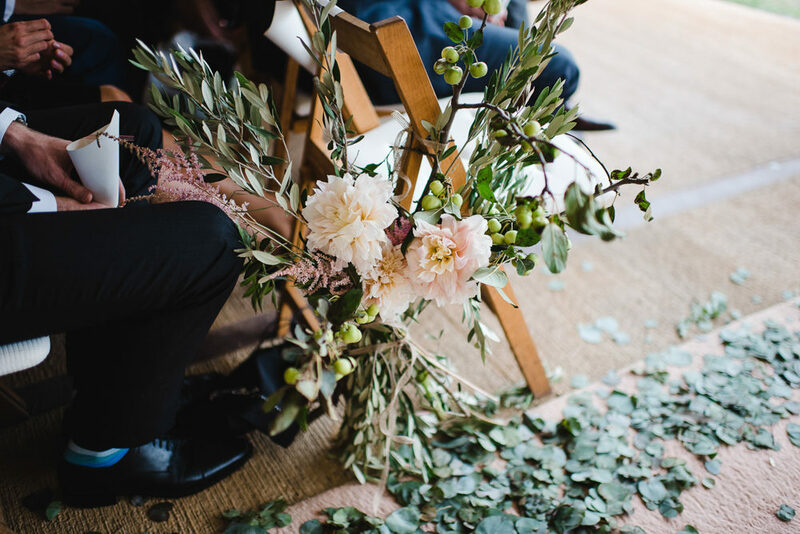 One night, a mere week before the wedding, I was frantically emailing our florist Natalia about details when she told me something I am thankful for to this day. She said: “This is your time to relax and enjoy your wedding. 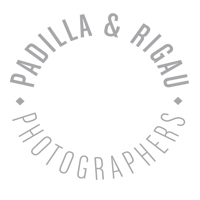 You’ve chosen us to help you with your wedding so put your trust in us and sit back and enjoy”. And so we did! My advice to couples planning their wedding would be 1) Find vendors who you like and trust and who understand you and 2) Involve your family a much as possible! I am so grateful for all the wonderful people we worked with, who worked so hard in the pouring rain, but also to our friends and family who put everything aside to help making our day a truly unforgettable one. Hi Tara, Thank you! 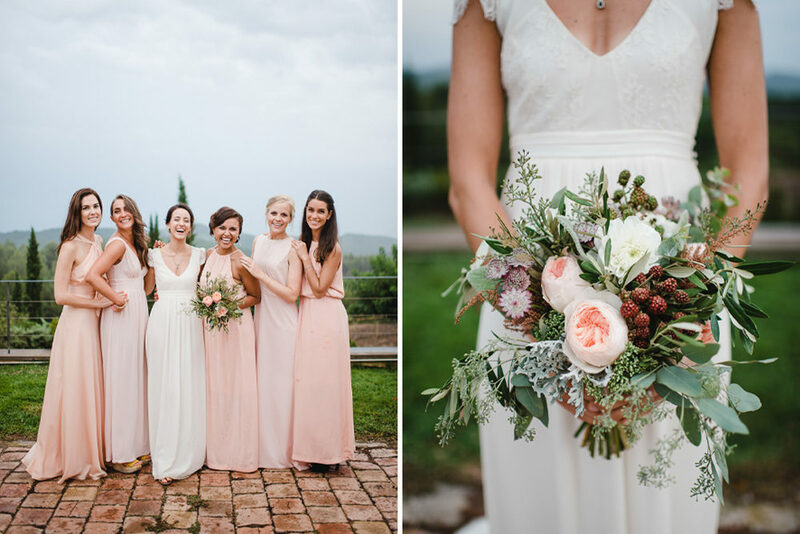 I just picked a color and let my bridesmaids find their own dresses. They are all from different places like H&M and Asos.